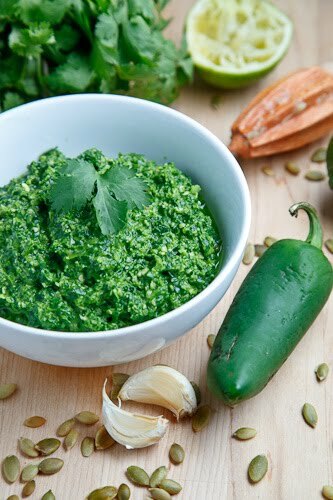 A tasty swiss chard pesto or salsa with jalapenos, cilantro, lime and pepitas or toasted hulled pumpkin seeds! Swiss chard is a green leaf vegetable that I enjoy but I feel that I do not use it nearly often enough so when I came across the idea of a swiss chard pesto on Bev Cooks , I was immediately intrigued and knew that I would have to try it. This pesto/salsa is pretty simple with a base of fresh swiss chard which is pureed with some garlic, jalapenos and pepitas (otherwise known as toasted hulled pumpkin seeds). I was thinking that this pesto is really more like a cross between a pesto and a salsa with its use jalapenos and I took that idea and ran with it a bit adding lime juice and plenty of cilantro. I have to say that this swill chard pesto/salsa is one of the best pestos that I have ever had and I found myself having to resist eating the whole batch by the spoonful before I got to use them in some tacos! Pesto is awesome! I love how you can take practically any kind of green and turn it into a pesto. I've done it with parsley and have been toying around with making some with broccoli in the near future. I love kale pesto, so I bet this is good! Looks and sounds delicious! I've make traditional basil pesto and a Kale/Almond version, but I love the idea of the seeds in this one. Will definitely have to try it! Silly question: where's the red? I have a bunch of swiss chard in the fridge right now, and the veins almost look like rhubarb! Did you discard them to get the beautiful colour? Marie: Swiss chard comes red, yellow and white. This week they only had the white ones at my grocery store but the reds would have looked better in the pesto. I love your recipes so far (just discovered your site)! I made chili, quinoa, and tacos, all excellent. I have a bunch of chard that needs something other than sauteing. I am going to make this pesto tomorrow. Do you mean to include "1/2 a lime, juiced" or some other measurement? Thanks for the clarification! I visit your site often and have used many of your recipes, but I'm a bit of a lurker. I'll make up for it by sending you a photo when I make it! Anonymous: The juice of one half of a lime. Enjoy! Looook at that. Yep. Yep and yep! This looks awesome. I'm so into chard and kale – some of the most nutritious food on the planet! Can't wait to try it. Is there any way to cut down on the oil or substitute something and make it work? Diane: More lime juice or water would help with the pureeing if you want to cut down on the oil. I've never made or even heard of swiss chard pesto but with your description you've certainly convinced me that it's worth a try! Going to try this, but with sunflower seeds instead of pumpkin seeds. I have all the other ingredients exept pepitas! So genius. I have some kale that needs used up pronto so I think I'm gonna try it that way. Just made this and WoW! Really delicious. This is some great stuff! A really unique flavor.. I made it with the red veined swiss chard, definitely changed the look from the normal bright green but I kinda liked it- sets it apart from the rest. I was going to make a cauliflower crusted pizza and I really dislike a tomatoey sauce since I put a pesto on my ground flaxseed crusted pizza a couple months ago. Anyway, I had some lovely swiss chard that I wanted to make a pesto out of and remembered you had a recipe for this. This chard is a bit harder to process in my processor than basil or cilantro, but this pesto is super, super yummy. I didn't want to add jalepeno, as someone eating the pizza doesn't like spicy stuff. Didn't have lime, but used lemon instead and it was so incredible. Thanks for the recipe!! We tried this with our CSA chard–thank you so much for the recipe! GREAT! Quick question–I'm planning to freeze the leftover pesto as we made a lot. I know basil pesto freezes well. Will this? stacy: I am glad you enjoyed it! This pesto does freeze well. Love the idea of adding the cilantro…good inspiration! Hey Kevin, Did you destem your chard? This recipe looks so tempting! i didn't think it had that much flavor. also, I added a bunch of parmesan, as one does with most pestos. janet @ the taste space: Yes, I cut the stems off at the base. This recipe looks wonderful, I just got some rainbow swiss chard from my CSA and am thinking of making this for the weekend. I was wondering if it would be good to be eaten as a salsa with chips, I know you said you added it to tacos. Chris: This swiss chard pesto would definitely go well as a salsa with chips! Where do you purchase pepitas? Anonymous: You should be able to find the pepitas in the section with the other prepackaged nuts or in with the bulk items in a local grocery store. This was great with pasta! I'm thinking of adding feta cheese next time. I'm going to try this as I have so much swiss chard in my garden. One of my favorite pestos is with broccoli rabe – I had overzealously purchased a ton of it when on sale and thought "pesto". It is really tasty and my husband, who is normally not a fan of broccoli rabe, liked it very much. maybe a dumb question… you use it raw? or steam it first? sarah: Everything in this pesto is nice and fresh and raw! Enjoy! Try it with arugula and cashews. Delicious!